The FTSE and CAC have opened up around 0.3% while the German Dax opened up around the unchanged mark. Overnight US markets were jittery and undecided for the Dow Jones closing near where it opened for the third day in a row. Overnight sentiment has not been good with fears that a stalling in the Chinese economic recovery could have resounding consequences across the world. So far though, stocks and shares are saying one thing while currency markets are saying another. Markets like the FTSE and Dow have been jittery these last few days, but haven’t succumbed to any serious selling. On the other hand, there has been a significant flight away from risk on currency markets. It’s a relatively busy day today with a slight rise in month on month UK house prices failing to impress the currency markets. Later today at 10.00 AM we have CBI realised sales from the UK and US GDP and unemployment claims at 12.30. Without doubt, the yen is today’s in play currency. Investors are flocking to the perceived safety of the Japanese currency with gains made across the board. The EUR/JPY is down 0.50% while the GBP/JPY is down 0.8%, the biggest move across all major currency pairs so far today. The sell off on the GBP/JPY has gathered pace this week with the psychologically important 150.00 level the next probable point of support. 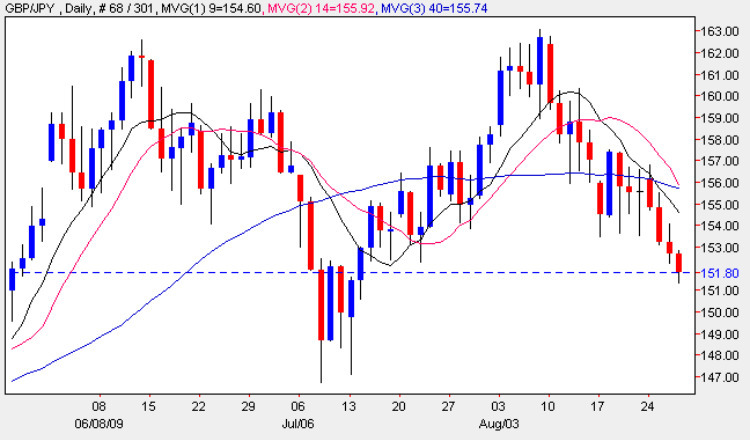 A double (fall) trade on the GBP/JPY over 1 day could be the best way to trade this. Double trades return 100% if successful.